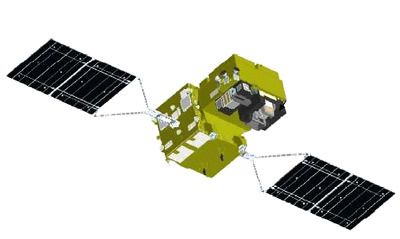 The GCOM-C (Global Change Observation Mission - Carbon cycle) aims to contribute to surface and atmospheric measurements related to the carbon cycle and the radiation budget. The payload consists of a second-generation GLI (SGLI) instrument. SGLI (Second Generation Global Imager). SGLI is an advanced multi-purpose visible/infrared (VNIR) imager of GLI heritage, flown on ADEOS-II. The objective is to measure ocean color, land use and vegetation, snow and ice, clouds, aerosols and water vapor, etc. SGLI is mainly focused to land and coastal areas. There are 11 channels with an IFOV of 250 m. GLI on ADEOS-II had only 6 channels of 250 m resolution. SGLI is a pushbroom instrument providing 29 channels in the VNIR (Visible Near Infrared) spectral region. In addition, there are 6 channels in the SWIR (Shortwave Infrared) and TIR (Thermal Infrared) regions being served by a whiskbroom scanner (mechanical method).